The First Group has taken possession of its second hotel property, TRYP by Wyndham Dubai, marking another significant milestone in its portfolio development strategy. The completion of the 675-room upper mid-scale hotel in Dubai’s sought-after Barsha Heights district also marks the TRYP brand’s debut in the city, cementing The First Group’s position as a respected property development firm with a strong track record in the emirate. The First Group and Wyndham Hotel Group celebrated the soft-opening of TRYP by Wyndham Dubai with a ribbon-cutting ceremony on 10 September. Speaking at the ceremony, The First Group’s Founder & Senior Partner, Danny Lubert, said the completion of TRYP by Wyndham Dubai further strengthened his firm’s successful partnership with the world’s largest hotel management firm. The First Group, which has built its reputation on developing high-quality serviced apartments and aparthotels in Dubai, is rapidly expanding its presence in the city’s upper mid-scale hotel sector, with multiple properties set to open before 2020, the year Dubai hosts the World Expo. In addition to Wyndham Dubai Marina and TRYP by Wyndham Dubai, The First Group has appointed Wyndham division Ramada to manage the forthcoming The One at JVC, which is currently under development in Jumeirah Village Circle, and the recently announced Sky Bay Hotel in Business Bay. 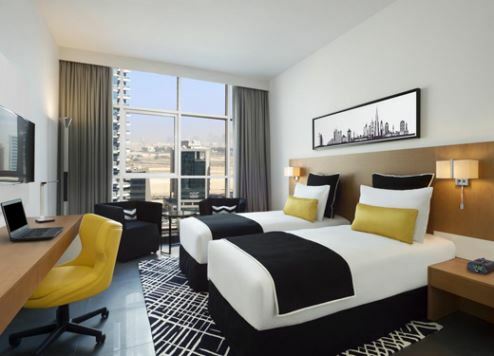 TRYP by Wyndham Dubai is situated in one of the city’s most vibrant urban communities, Barsha Heights, which is home to many creative SMEs, local businesses and residential developments, as well as The First Group’s global headquarters. Key business districts including Dubai Media City, Dubai Internet City and Emaar Business Park are located nearby, as are top leisure, retail and entertainment destinations such as Mall of the Emirates, The Beach and The Walk at Jumeirah Beach. Stand out features of the hotel, which is described as a “hip upscale lifestyle property” by Wyndham, include a swimming pool, gym, innovative pop-up shop concept, ‘VYP’ Lounge for VIP guests and Premium Wyndham Rewards members, multi-purpose meeting and event spaces and two F&B outlets – Plaza Central featuring an outdoor terrace and the Dip Deck pool lounge.